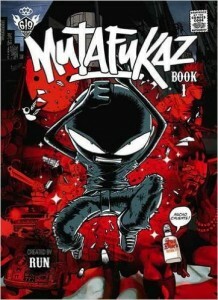 Here’s the brilliant new trailer for MUTAFUKAZ! Angelino is a young loser like thousands of others in the Dark Meat City. He and his friend Vinz are squatters at a seedy hotel room in the Latin Quarter, Rios Rosas. Angelino spends his days watching Mexican wrestling matches on TV, delivering pizzas and having bizarre metaphysical discussions with his roommate. A stupid scooter accident will plunge Angelino into a hurricane of unimaginable trouble, as he becomes the only person on Earth capable of recognizing the vicious cosmic entities that walk among us, who are readying themselves to invade the planet.